Note: the old guide is kept as a redirect and some information is kept for personal archiving purposes. What Operation Do I use? Review the notes below to change the operation according to your particular setup. If your system has a 30-60 GB mSATA Solid State State Cache Drive and a conventional hard drive you should review this document here and change the SATA operation to Intel Smart Response Technology. Direct installation on a drive this size is not recommended as the drive is too small to comfortably fit a Windows installation. In this configuration the SSD should not display during Windows setup and instead be utilised as a Cache Drive when the appropriate Intel Rapid Response Technology application is installed within Windows. This configuration is not recommended by the author of these guides as it can cause in boot problems later down the line. In such configurations it is recommenced to place the small cache drive with a 128 GB or superior mSATA drive which is large enough to support a Windows installation. In such cases the SATA operation should be changed to AHCI to allow direct Windows installation. See Hardware Upgrades for your System for more Details. If you have a 128 GB or superior mSATA drive then the SATA operation should be AHCI which will allow for installation of Windows on the SSD. If AHCI is not available select RAID or ATA. In systems where a mSATA port is occupied by a 128 GB or superior mSATA SSD drive and the conventional hard drive bay is occupied by a 2.5″ (laptops) or 3.5″ (desktops) hard drive. Windows should be installed on the SSD as it will give Windows a faster access time and superior performance but is more expensive per GB so user data should be saved on the conventional drive. For desktops without mSATA ports a 2.5″ 128 GB or superior SSD can be installed using a 2.5″ to 3.5″ converter. The SATA operation should be AHCI which will allow for installation of Windows on the SSD. Windows should be installed on the SSD as it will give Windows a faster access time and superior performance but is more expensive per GB so user data should be saved on the conventional 3.5″ drives. For laptops without mSATA ports a 2.5″ 128 GB SSD or superior can be installed. The SATA operation should be AHCI which will allow for installation of Windows on the SSD. However in this configuration a large conventional HDD for large volumes of data storage cannot be installed simultaneously. The user should decide whether to store data on an external hard drive in such cases. 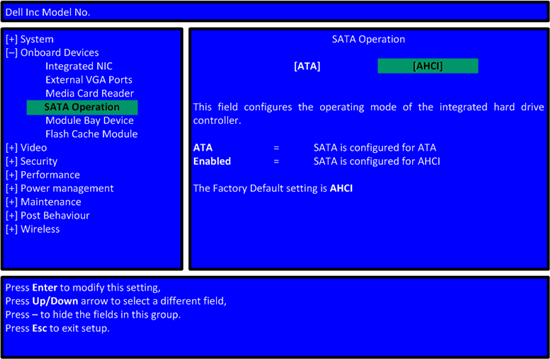 For non-SSD configurations the SATA operation should be set to AHCI if supported. In older systems this option may not be available so use ATA or if thats not available use IDE. When purchasing a SSD upgrade ensure that you have SATA connectors and/or mSATA connectors in your system and purchase the suitable SSD upgrade. If all your connectors are IDE its probably time to upgrade your entire system as Windows 7 won’t run well on such poor hardware., the hard drive is likely to fail and is hard to source spares for as IDE drives are no longer manufactured. 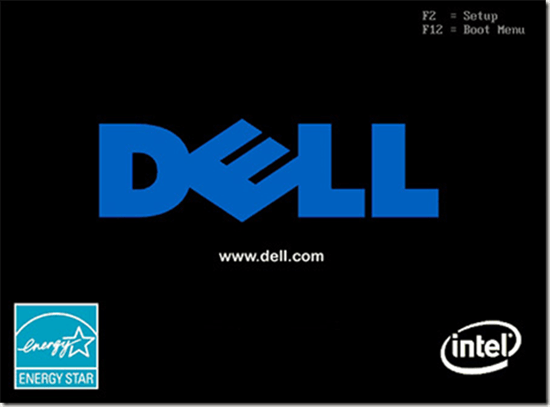 Power up your system and press F2 at the Dell BIOS screen to enter the BIOS setup. In the BIOS setup there should be a category called onboard devices, use the arrow keys to highlight it and press enter to expand this category. Switch the category from AHCI to ATA or ATA to AHCI as desired. Press esc to take you back to the earlier menu and esc again to exit. 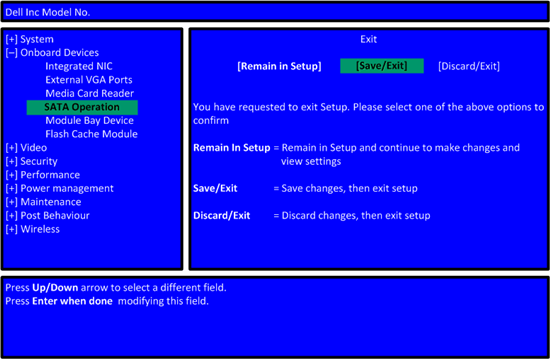 Select Yes when prompted to Save Configuration and Exit. when using a PNY Optima 240BG SSD in a newer variant Dell XPS8300, I ran into the problem that when the SATA BIOS setting was set to AHCI, the clean install of Windows 7 would fail or end up corrupted. I had to set the SATA to RAID in the BIOS in order to install Windows7 on the PNY SSD, just in case anyone else with a late 2010 XPS8300 has a similar issue. Now I get a message after the POST screen from Intel RST that my two drives are non-RAID, but at least the SSD works. My XPS 8300 worked with a Crucial 120 GB M4 SSD, Crucial 128 GB MX100 SSD and a Crucial 512 GB MX200 SSD in AHCI without any need to load SATA drivers for Windows 7 64 Bit. I think if I ever need to get new/different SSD’s, I’ll go with Crucial. It was my first choice, but it wasn’t in stock at the time. Should have waited. The PNY website does state that if you have issues, try switching the BIOS from AHCI to RAID, and it was a last resort for me to try it after spending over a week troubleshooting the Windows installation. On that point, @DellCares was amazing for the support provided while I was scratching my head as to why everything I was reading online (here as well as others) wasn’t working. I found a response on the Dell EU forums where a tech suggested switching to RAID and I figured it was better to try than RMA’ing the drive. Now I get to do this all over again on my girlfriend’s Dell; at least I know what I’m doing now. You’re site is a fantastic resource; thank you for all the work that must go into maintaining it! The instructions are similar for Windows 7 and its how I’ve got my XPS 8300 configured. I have 1 512 GB MX200 in SATA0 and then 2 1 TB HDDS in SATA 2 and SATA 3 with the SSD in the space for the second optical drive. I have also an inatech PCI express (x1) card with 4 USB 3.0 ports at the back and a Creative PCI express (x1) Soundblaster installed so my machine is pretty much fully upgraded. SSD wise and RAM wise I’ve stuck to Crucial. Crucial SSDs, Samsung SSDs and Intel SSDs are meant to be the best three vendors. When i go to Advance> SATA operations> there’s only one – ACHI option! No RAID or IRST or anything else. What should i do? I need somehow disable ACHI to make some programs (MHDD and Victoria) work. No sense in RAID or Intel Rapid Smart Response Technology as these require multiple drives. In any case Intel Smart Response Technology is long obsolete as SSDs have a large enough capacity and are affordable to be used as a standard boot drive. I don’t know either program you are trying to use but at first glance both seem fairly outdated and probably will not work on new hardware.